Interest in sensory atmospheres and architectural and urban ambiances has been growing for over 30 years. A key figure in this field is acclaimed German philosopher Gernot Böhme whose influential conception of what atmospheres are and how they function has been only partially available to the English-speaking public. 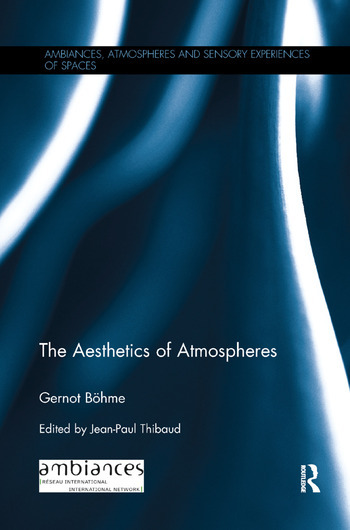 This translation of key essays along with an original introduction charts the development of Gernot Böhme's philosophy of atmospheres and how it can be applied in various contexts such as scenography, commodity aesthetics, advertising, architecture, design, and art. 16. Metaphors in architecture–a metaphor? Gernot Böhme (Author) was Professor of Philosophy at TU Darmstadt, Germany between 1977 and 2002 and has been director of the Institute for Practical Philosophy in Darmstadt since 2005. His research interests include the philosophy of science, theory of time, aesthetics, ethics, and philosophical anthropology. Jean-Paul Thibaud (Editor), sociologist, is CNRS Senior Researcher at CRESSON/UMR Ambiances Architectures Urbanités. His field of research covers the theory of urban ambiances, ordinary perception, and sensory ethnography of public places. In 2008 he founded the International Ambiances Network.